The affordably priced Datacard® MPR3800™ GSM card issuance system is designed to measurably improve speed, security and profitability in your SIM card operations. This system is built on a proven platform, which has demonstrated superior productivity and security in incredibly demanding issuance environments worldwide. Deliver up to 3,400 SIM cards per hour. Issue single or double SIM chip cards.An extension of the proven Datacard® SD Series, the affordable and efficient Datacard® SD160TM card printer offers the right combination of technologies to meet a wide range of application requirements. Direct-to-card (DTC) printing technologies provide the versatility to reliably produce attractive cards with high quality, full-color or single-color photos, graphics and text. Learn more about the MPR3800 by downloading the datasheet. The system controller features an easy-to-use graphical interface plus the hardware and software required to control the activities of each card personalization module, data and the system as a whole. The card input module on the MPR38000 system feeds cards reliably into the system. Multiple card input modules can be installed in a system to increase capacity for large jobs. The barrel smart card module on the MPR3800 system personalizes single or double SIM cards in the same module with impressive speed, accuracy and security. Multiple smart card couplers are also available. This system can be configured to flip the SIM card to enable back side laser engraving of the card. 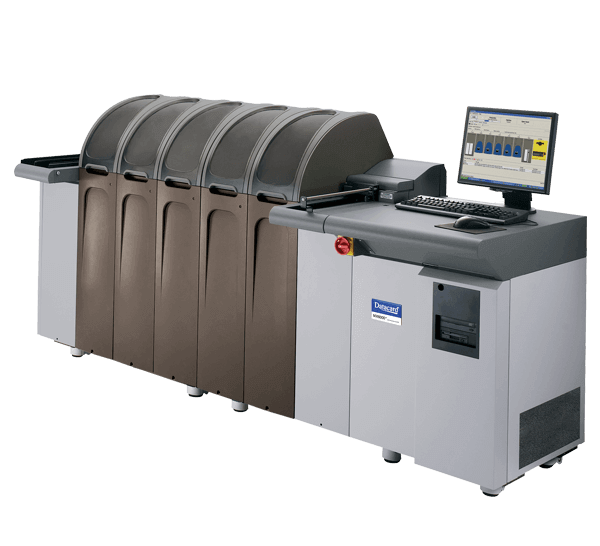 The laser engraving module on the MPR3800 system utilizes the latest in engraving technology to deliver high-speed, high-quality laser imaging of cards. The card output module on the MPR3800 system is designed with two trays: one tray for good cards, one tray for rejected cards. Multiple card output modules may be installed within a system in order to expand output capacity, or to allow card groupings to be separated for quality control, downstream processing/handling or for varying methods. See how the Central Issuance System Controller software provides an easy-to-use interface for a long list of Datacard® high-volume card systems by downloading this brochure.